What would it take to configure MoodleBox to support Captive Portal? I would like my MoodleBox to automatically open my default web browser and go to http://moodlebox.home. Or even allow me the option to switch Captive Portal on and specify URL. This is to accommodate for custom MoodleBox URLs. jodi319 It's indeed possible, eg. using a software like https://github.com/nodogsplash/nodogsplash. You'll have to install it manually, then configure it to your needs. Please refer to the nodogsplash documentation. I decided to implement this in a next version. You may follow the implementation progress on GitHub. 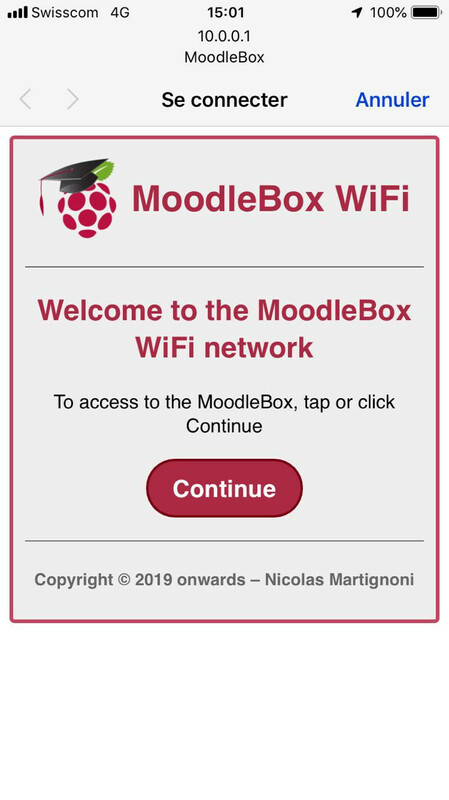 Captive Portal Detection fails if the MoodleBox is not connected to the Internet, which casts doubt on the usefulness of having such a feature on the MoodleBox. It uses rpi to provide internet to the users and have a captive portal. I have managed to redirect the portal to my phpbb but it is on a desktop pc using xampp. In this regards, i would like to try to use moodle box to be combined with adopisoft. Separate rpi. Moodlebox's disabled dhcp ip aligned to adopisoft's ip. Combine moodlebox to adopisoft sd card. kutipoy I'm afraid I can't integrate MoodleBox with AdoPiSoft, since it's not free (neither as beer, nor speech). However, I'm sure one could replicate your scenarios with NoDogSplash (which is free as beer and as speech 👍️ ) once I'll release the next version of the MoodleBox. Can I assume some of the knowledge here is applicable? Yes 😀 , but you won't have to do all of this, because it will be preinstalled. All you'll have to do is enable the Captive portal, which will be disabled by default.